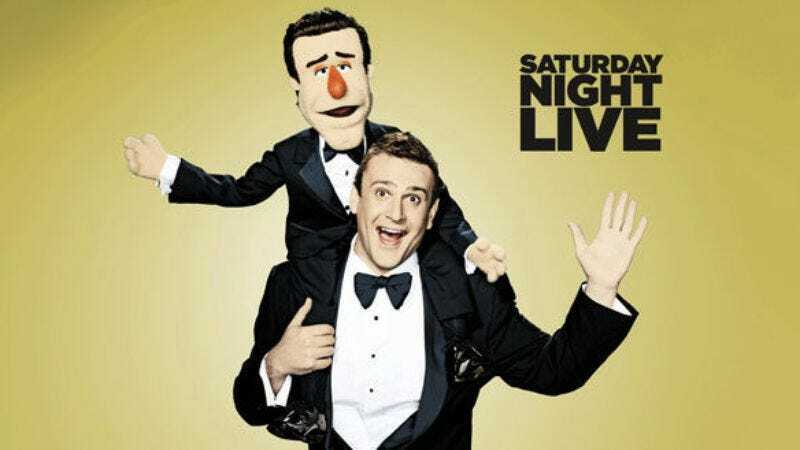 Honestly, I don’t know who’s cuter, Jason Segel or Muppets. I went into last night’s episode knowing I was going to have a pretty good time (unless the Muppets didn’t show up, which would have just been weird). This was another solid episode in what’s proving a strong, if weirdly under-the-radar season for SNL; my only problem was the lack of screen time given over to Segel, since he was obviously more than up to the task in the sketches. For example, my favorite sketch of the night was Andre the Giant choosing an ice cream flavor, which was Segel, and Segel only – most likely something he pitched to the writers because he knew he could do it, but nonetheless he was spot-on in his impression. SNL sketches are almost always better off when they’re shorter – it’s one reason why the digital shorts have proven so popular. But I’m gonna re-watch the hell out of that thing on Hulu. After a very dull Mitt Romney sketch – Sudeikis is funny, the gag that he’s a boring dude is fine, but let’s find a new angle, folks – Segel started things off well by singing with the Muppets in that trademark Muppet style: sweet, heartwarming with a nice little jokey edge. Kermit’s Ray Romano impression and the appearance of Statler and Waldorf were what did it for me here. Even a re-run of the “Red Flag” perfume ad wasn’t going to dampen my spirits, I was pumped. What followed were a bunch of mediocre skits – on paper, I should be ranting. The Live with Kelly replacement host thing was just an excuse for a bunch of impressions. The return of the Vogelchecks is hardly groundbreaking. New Jack Swing was targeting a very specific period in music and only kinda hitting the mark. And that overlong retirement party sketch with Segel as the overly dramatic buffoon was aiming for something, and occasionally hit on it with its pregnant pauses, but mostly missed the mark. But, honestly, I was laughing pretty consistently through it all. The string of impressions ranged from the usual stuff like Jay Pharoah doing Denzel, Kenan Thompson as Charles Barkley and Bobby Moynihan as an over-the-top lady (this time, Rosie O’Donnell) but I very much enjoyed Sudeikis nailing Ricky Gervais’ grating, giggly mannerisms, Fred Armisen barely able to sit in a chair as George Lopez and, best of all, Bill Hader as Garrison Keillor (Hader just has the market cornered on famous old cranks). But Segel’s appearance at the end as Antonio Banderas felt tacked-on, just a way to get him in the sketch without letting him do too much in it. The same happened with New Jack Swing – he was fine in his 15 seconds, but the placement of him at the end was kind of unusual, leading me to just wonder the whole time if/when he was going to show up. It’s not like he got less to do than most guest hosts – he was the star of three or four skits and background-y in the others, which is typical – it was just more noticeable, and more unfortunate because of how funny he is. The Vogelchecks basically are what they are – every sketch since the first one is just an escalation game to see what silly mouth-related thing they can do to each other. But they always pick good hosts for the concept (James Franco, Paul Rudd) and the surprise appearance of Rudd (who Segel basically started to eat by the end of their make-out session) fed into a weird concept of the sketches all being linked which I found extremely amusing. I’m also always happy to see Paul Rudd. The retirement thing was way shakier. Its problem was that it had three vague concepts and wasn’t really interested in sticking to any of them, which may or may not have been intentional. Segel’s silly character was the centerpiece, except for when Kristen Wiig took the stage as the shy secretary who screamed at everyone for making her speak. The succession of people in increasingly weird costumes making faces at the camera came out of nowhere and seemed lifted from something else entirely. And, of course, the punchline was a let-down, by design. I wanted more of Segel’s weird character, or really less of Wiig’s – they were both way too big to share any laughs there. Also, there was a lot of short stuff that totally worked. The tempur-pedic mattress for masturbation was great and Segel brought a lot to it just because he’s so damn big. Kermit’s appearance on “Really!? !” was inspired (it’s a lot of fun to watch him freak out); Jon Huntsman’s less so, but I guess he could have been more wooden. The digital short was possibly the best of the year so far – it had all those weird production details Samberg et al do so well – and, of course, Andre the Giant. Let me go watch that right now. The final sketch with the song about Massachusetts felt like an old joke (and gave me “sparkling apple juice” flashbacks) but served as an effective capper to a Muppet-inspired episode. I don’t need every SNL host to bring such a warm and fuzzy theme to his appearance but it suited Segel even without the Muppets and felt perfect with them. With Andre the Giant this week and Ben Stiller playing Mandy Patinkin in his episode, there’s definitely a Princess Bride theme building here. Mitt Romney can’t keep his jacket unbuttoned – it makes him uncomfortable. Abby Elliott’s Zooey Deschanel wasn’t quite there voice-wise, but she definitely had that mannered cuteness vibe down pat. Was that Olivia Wilde watching Samberg eat a wine glass?